Ask fellow campers about "Brown County Fairgrounds" and nearby attractions. We stayed 3 nights at site 6. There is 50 and 30 amp electric and water. There is a dump station. Some sites are parallel on asphalt, and others back in to the grass. It was kind of confusing. There were large shade trees at the back-in sites on the grass. The parallel sites sit on blacktop with no shade. It is first come first serve, with no host. There are so many Canada geese, and they poop all over the boat launch, the roads to the boat launch, and the camp sites opposite the boat launch on asphalt. It is a shame the county supervisor or workers in charge do nothing about all the geese poop! It reflects poorly on the county! We camped here to be close to Lambeau Field (3 miles away), and the Oneida Casino (4 miles away). It sits next to the Fox River, and there is a plant on the river that makes noise, so we had to use our ear plugs at night to sleep. There are biking trails that are nice next to the campground, as well as a very nice beach pool and park in Ashwaubenon, just down the road! The campground is very convenient to Lambeau Field, restaurants in Green Bay, Costco, and restaurants in De Pere. We would return here if visiting Green Bay in the future. We camped at Brown County Fairgrounds in a Fifth Wheel. Visit Lambeau Field and take a tour. The 1919 Kitchen & Tap restaurant had great appetizers, food, and drinks at Lambeau Field. Costco and the Oneida Casino are about 4 miles away in different directions. Restaurants are also in De Pere. There is a BP gas station across from the campground for gas or diesel. Oddly arranged camping area. A large grass area with utilities around the edge in one area. A series of utilities along a fence. And a series of utilities along a paved parking area. Total 56 labeled sites. None marked, so there was some free styling that took up more than one spot. Fairground is apparently popular with local groups for parties. Quiet time starts at 10pm. The local Green Bay police are quite willing to stop by and remind folks of that. We camped at Brown County Fairgrounds in a Travel Trailer. Fairgrounds is a little over a mile from the National Railroad Museum. The best Diesel price in the area was at the BP station across the road. There is a grassy area with some shade. I parked on the edge of the main road which is very wide. We camped at Brown County Fairgrounds in a Motorhome. Many racetracks in the area. Have to go back another time to get to the rest. $25/night with water and 50 amp electric. (I didn’t look to see if they had anything else except 50 amp service.) Cash or WI check ONLY. Camping is confusing. Map at self-registration station shows what sites are electric and which are electric & water. Hook-ups are on the grass next to the road. Some people parallel park on the road and hook-up under the rig or drive onto the grass with the tail facing the road other stay on the road and back up to the hook-ups. The park attendance put trash cans out near us the day we left. The bathhouse was clean, but you can only use the showers from 9 PM to 9 AM, the rest of the time they are locked. We were lucky we had one of the 5 tables in the park. There is a lot of construction that you can hear around the clock. The grass and the open areas of the park are nice, BUT there are goose droppings everywhere: on the walks, boat ramp and docks and all over the grass. You or the dogs can’t walk anywhere with getting into it: what a mess ! We will look for another place to stay next time we are in the area. We camped at Brown County Fairgrounds in a Motorhome. This is a neat little short term stay location. It was very quiet and not very busy. Our MH was located on asphalt at the furthest end of the camping area overlooking the boat launch. We were able to watch a lot of local geese wander the nearby soccer fields. We also got to see a pair of local eagles that nest in the area. The only real downside was the dump station that was located on an incline from where you stop your RV. All-in-all, we enjoyed our stay here while visiting the Packer Facilities and wandering through all the shops in nearby Door County. We camped at Brown County Fairgrounds in a Motorhome. The sites are grass and large. A few sites have water and electric. The power pedestal serves two sites. The showers are coin operated (we did not use them we used our shower) The website: 1) Shows the dates the campground is not available when the county fair or other special events are being held. 2) point to a brochure about the campground. 3) gives the driving directions for getting to the campground. There are no reservations. Strictly first come first serve. We camped here with a group. The campground itself was quiet, there is some train noise. We camped at Brown County Fairgrounds in a Motorhome. 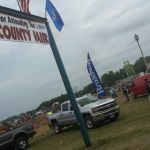 Are you affiliated with Brown County Fairgrounds ?